With Apple switching up its game and announcing three new iPhones today instead of the usual two, there’s now some confusion between which features come on which handsets. So to make things a bit clearer, here’s a rundown of all the major differences between the iPhone 8, iPhone 8 Plus and the iPhone X. The iPhone X will come in space gray and silver, while the iPhone 8 and 8 Plus will get a third color option in gold. Aside from their screens, the iPhone 8, 8 Plus, and X aren’t that different inside. They all come with Apple’s new A11 Bionic Chip, which features a six-core design with two cores dedicated to intense processing, and four cores to help keep things energy efficient. They also all have wireless charging and the same storage options, starting with a base of 64GB or a larger 256GB upgrade. The screens however, are where things diverge, as the standard iPhone 8 sports a 4.7-inch 1334 x 750 LCD, while the 8 Plus features a 5.5-inch full HD (1920 x 1080) LCD. Then there’s the iPhone X, which will have a entirely different type of display thanks to its so-called Super Retina OLED panel which has an even higher 2436 x 1125 resolution. The iPhone X will also be the only iPhone with HDR video support and a super high contrast ratio of 1,000,000:1 (versus 1,400:1 for the iPhone 8). 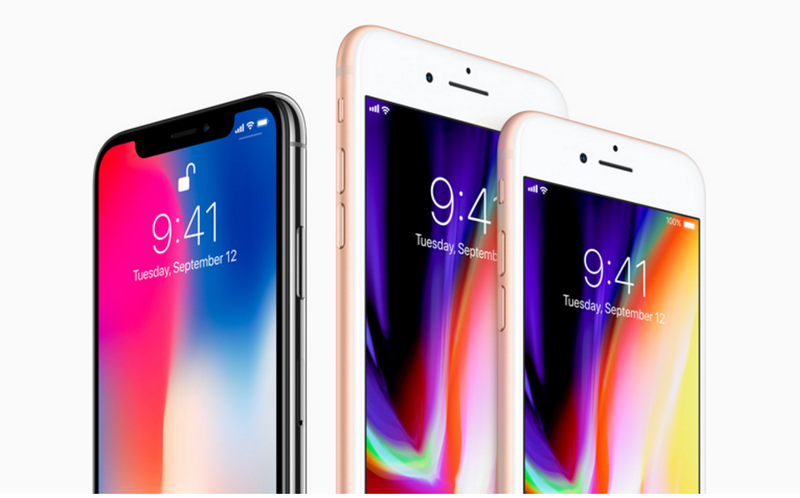 Size-wise, despite having a larger screen, the iPhone X (5.65 x 2.79 x 0.3 inches) is actually smaller than the 8 Plus (6.24 x 3.07 x 0.3 inches) thanks to its non-existent bezels, while the standard iPhone 8 remains the smallest of the bunch at 5.45 x 2.65 x 0.29-inches. The standard iPhone 8 still gets one rear camera, while the iPhone 8 Plus gets two. As with the last generation of iPhones, the standard iPhone 8 is still limited to a single rear camera, while the 8 Plus and X sport dual 12-megapixel shooters in back. On the front, all three iPhones features the same 7-MP f/2.2 selfie cam. But when you dig a little deeper, there are some subtle, but important difference between the dual cam setups on the 8 Plus and X. First, the iPhone X has optical image stabilization on both cameras, while the 8 Plus has OIS only on its main camera, not the zoom. On top of that, the iPhone X’s secondary 2x zoom camera has a larger f/2.4 aperture, which will let in more light and capture better low-light photos than the iPhone 8 Plus’ f/2.8 2x zoom cam. The iPhone X trades out TouchID for FaceID. Take your pick. The last major differentiator (besides price) between the new iPhones is the iPhone X’s lack of home button and TouchID. Instead, the X sports Apple’s new FaceID system which will scan your face anytime you need to unlock your phone or use Apple Pay. Starting at $699, the iPhone 8 is the cheapest of the three, while the iPhone 8 Plus costs $100 more at $799. Both will be available for pre-order starting September 15, with shipments going out on September 23. Meanwhile, if you want the iPhone X, you’re going to have to wait. Pre-orders don’t start until October 27, and shipments slated for November 3. Also, you’re going to have the shell out $200 more than the iPhone 8 Plus thanks to the X’s starting price of $999. And if you want an iPhone X with 256GB of storage, you’re going to have to shell out a whopping $1,149. As revolutionary as Apple made the iPhone X out to be, in some ways, it’s mostly a style play. There’s no doubt the X is the best-looking iPhone yet, but aside from that bezel-less OLED screen, its only other advantage over the 8 Plus is a slightly better secondary zoom camera. Some people might even say the X is downgrade, as trading out a home button and TouchID for facial recognition could be a jarring change for what has become an important mainstay feature. Then again, if you want the latest and greatest from Apple including that new Super Retina screen, there’s really only one way to go. The choice is yours.